Thanks to the hard work of our area snowmobile clubs and volunteers, an extensive network of professionally groomed trails — more than 1600 miles — are maintained in the Minocqua area. These trails traverse a magnificent natural environment that includes 1,300 glacial lakes and 233,000 acres of public forest land. This, combined with our 65-inch annual average snowfall, makes for some of the Midwest&apos;s best sledding. Take off in any direction to sled on spacious and well-marked routes across forests and frozen lakes. The locale features a number of trail side pit stops, as well. Step inside and enjoy the atmosphere, but please be responsible. Don’t drink and drive. Area trail maps are available at the chamber office or can be mailed to you upon your request. 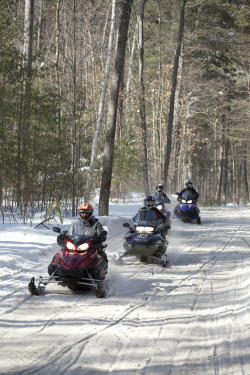 Oneida County Snowmobile Trails Closing Date Due to rapidly deteriorating trail conditions, the user-funded snowmobile trail system in Oneida County will officially close for the season at 11:59 p.m. on Sunday, March 24, 2019. The Oneida County Forestry Department would like to thank all the snowmobile clubs and volunteers for their work in keeping our trails in great shape. Cross Country Cruisers Trails are holding on, but the warm temperature are taking their toll. The trails in the wooded areas are still fairly good but most road routes and trails in and near town have deteriorated quite alot. The forecast for the upcoming weekend is for temperatures near 50 on Saturday and mid 40s on Sunday, with some sunshine this weekend’s weather is pretty much going to put an end to the trails. Please look for conditions to change daily, watch for standing water in some areas and use caution on trail 51 north of intersection 305. There is logging and trucks hauling in this area and the trail is very thin on snow. Please stay to the right and respect the loggers. The Vilas Co Alliance met last night for their monthly meeting and a trail closing date was set for Sunday 3-24-19 at 11:59pm. All eleven clubs unanimously voted to close. Most clubs have stopped grooming for the season also. The Cross Country Cruisers would like to say thank you to everyone who rode our trails and visited use this season. It was a great season and our area businesses and club sponsors appreciate you stopping in. We certainly appreciate your complements and support for our club and volunteers!! We hope you had a great experience and look forward to seeing you again!! Have a great Summer. The good new is our trails are in remarkably good condition for this time of year. The bad news is that as we continue with these above freezing temperatures, trail sections that run on roads or are exposed to a lot of sunshine are deteriorating at a faster rate than the wooded sections of trail. So, it might be somewhat of a challenge to get to the trails. But once you’re there, our trails should be in Fair to Good Condition. Pier/Willow Region Trails: Trail #5, #8, #12 and I (Iron Gate Road) should be in Fair to Good Condition. Trail Concerns: Trails that are on Snowmobile Routes (running on the sides of roads) have deteriorated. This includes portions of Corridor 10, Trail 10A and Trail K. Also Trail K, heading east from TIN-671 to Hazelhurst, has lost the most snow and is in Poor Condition. Trailer Parking: There are 3 parking locations within our trail system to park vehicles with trailers. You can find their location on our trail map by looking for a red circle with a white P inside of it. The first location is at the Minocqua Park Complex on WI Highway 70 West. The second location is the parking area for Squaw Lake off of West Squaw Lake Road near the Pike Lake Area. The third location is in the Pier/Willow region on Flowage Road. When Will The Season End? Looking ahead at the 10 day forecast, it appears this weekend might be the beginning of the end of our snowmobiling season. Weekend Weather Outlook (as reported by weather.com): Temperatures are beginning to warm up and will top out at 50 degrees on Saturday, under sunny skies. Look for a cloudy day on Sunday with a high temperature of 45 degrees. The winds will be variable at 8 mph throughout the weekend and the overnight low temperature will average 21 degrees. 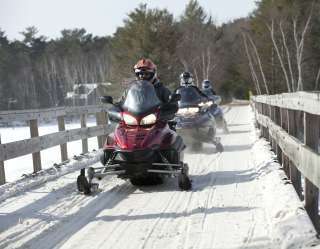 Wisconsin law requires those who use Wisconsin snowmobile trails to display either Wisconsin registration or a snowmobile trail pass. Funds from this program will be designated for use as trail aids and related costs to enhance all Wisconsin snowmobile recreation. The trail pass may be purchased over the counter at many authorized sales locations. The $35.00 non-resident snowmobile trail use pass is valid from July 1st through June 30th. 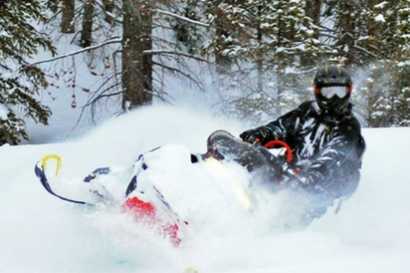 A snowmobile trail pass is required to operate a snowmobile not currently registered in Wisconsin on a snowmobile trail. The snowmobile must be currently registered with another jurisdiction. The trail pass must be permanently affixed by its own adhesive to the bottom center portion of the snowmobile windshield. If there is no windshield, the sticker shall be displayed in a highly visible location on the front of the cowling of the snowmobile. Once affixed, the sticker may not be removed or transferred to another snowmobile. A snowmobile safety certificate is required for all snowmobile operators born after January 1, 1985. A certificate is required in order to operate a snowmobile on public trails, lands, and frozen waters. A valid driver’s license does not exempt you from the safety certificate requirement. It must be carried while riding and it must be displayed to a law enforcement officer when requested. Maintaining 135 miles of scenic and well-groomed trails throughout the Arbor Vitae, Woodruff and Minocqua area. 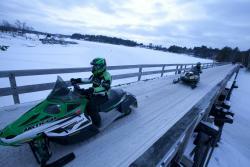 Providing excellent snowmobile trails for all to enjoy in the Lac du Flambeau area.